For many, the term “street art” still has something of a seedy connotation, conjuring up images of the graffiti tagging and vandalism that occurs in many urban neighbourhoods. However, modern street artists are challenging these notions, and today street art has become an incredibly diverse and unique art form, gaining increased recognition and legitimacy from both the public and authorities. 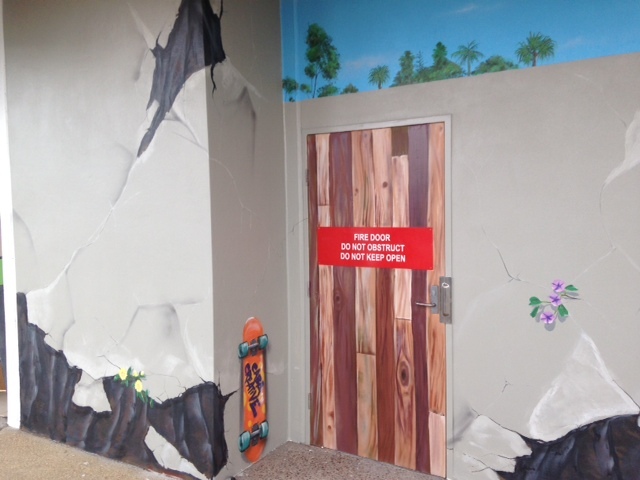 Caba Creative, a local Not For Profit Organisation in Cabarita Beach, has recently commissioned a local artist to enhance a small wall space in the main street of the village. This space will become a local community notice board with funds raised from advertising around the board assisting to fund a local youth worker. This is one of many projects Caba Creative are working on with an Eco Carnivale Planned for March this year. Don’t miss this year’s Eco Carnivale on March 1, 2015 from 10am to 4pm in Cabarita Beach. This is a family-friendly event that everyone is sure to enjoy. Have your fill of music, community art, workshops, eco displays, children’s activities and creative stalls. Meet artisans, musicians and like-minded individuals. Entrance is free, so join in the fun. If you are planning a trip to Cabarita Beach, you may want to book our Cabarita Beach Accommodation. We offer a selection of two bedroom, three bedroom and four bedroom apartments. Our fully furnished apartments are complete with everything you will need. Apartment amenities include bedrooms, bathrooms, WiFi and more. Aside from our elegantly designed apartments, we also have guest facilities which include two outdoor swimming pools, a fitness room, a day spa, a restaurant and bar, barbecue facilities, a business centre, dry cleaning, a spa, a tour desk, and more. Take a refreshing dip in the outdoor pools. Soak in the spa and feel the stress melt away. Enjoy delicious meals at the restaurant, or cook up a homemade feast using our barbecue facilities. Enjoy your Cabarita Beach holiday at our accommodation. To book our accommodation, click here.